Localized scleroderma (LSc), a connective tissue disorder restricted to the skin and subcutaneous tissue, is characterized by skin fibrosis due to an excessive deposition of types I collagen. The mechanism of such fibrosis is still unknown, but epigenetics may play some roles in the excessive collagen expression. In the present study, we investigated the mechanism of fibrosis seen in LSc, focusing on microRNA (miRNA). miRNA expression was determined by PCR array, real-time PCR, and in situ hybridization. The function of miRNA was evaluated using specific inhibitor. Immunoblotting was performed to detect α2(I) collagen protein. 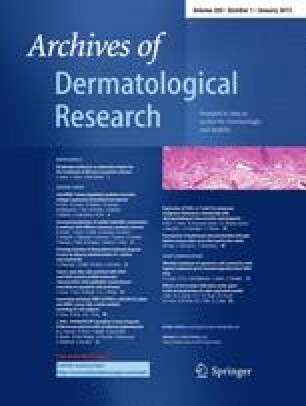 PCR array analysis using tissue miRNA demonstrated miR-7 level was significantly decreased in LSc skin as well as keloid tissue compared to normal skin in vivo. In situ hybridization also showed miR-7 expression in dermal fibroblasts was decreased in LSc dermis. The transfection of specific inhibitor for miR-7 into cultured normal dermal fibroblasts resulted in the up-regulation of α2(I) collagen protein in vitro. Also, the serum levels of miR-7 were significantly decreased in LSc patients compared with healthy controls, but serum miR-29a levels not. Systemic or local down-regulation of miR-7 may contribute to the pathogenesis of LSc via the overexpression of α2(I) collagen, and serum miR-7 may be useful as a disease marker. Investigation of the regulatory mechanisms of LSc by miRNA may lead to new treatments by the transfection into the lesional skin of this disease. We thank Ms. Junko Suzuki and Ms. Chiemi Shiotsu for their valuable technical assistance. This study was supported in part by a grant for scientific research from the Japanese Ministry of Education, Science, Sports and Culture, by project research on intractable diseases from the Japanese Ministry of Health, Labour and Welfare, and by Shiseido Research Grant.